Recording vocals seems easy at first. Just put a mic in front of your face and hit the “record” button, right?! If that’s the case, then why is it that everyone and their mother is asking about how to get better vocal recordings? 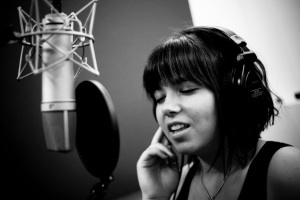 Vocal recording and production is a huge topic mostly because vocals are what drive modern music, so you want to get them right. 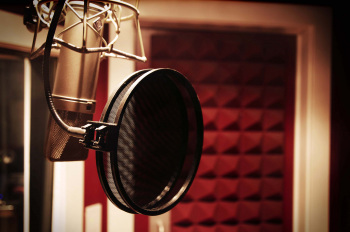 The first step to a great vocal in your tracks is to record it better. So today I want to give you one very simple, very easy, no cost way to record better vocals at the source. This will make your mixing life a lot easier and you’ll enjoy the final product more. Are you ready for it? Too many of us home/project studio people think the best way to record vocals is to put the vocalist right up on a mic. And when I say “right up on a mic” I’m talking anywhere from 1 to 6 inches away. Why do we do this? Two reasons: Because it’s what we see in the magazine ads and because we’re afraid of our “bad” room sound. Two potentially bad things happen when you record that close to your mic. First you’ll get a lot of low end bass build up in your voice thanks to what’s known by the smart people as the proximity effect. Voiceover guys and broadcast announcers take advantage of this because it makes their voices sound boomier and bigger. For music recording, this is not a good thing. It will muddy your vocals and eat up tons of headroom in your mix. Backing up from the mic instantly cuts out unnecessary low end, which allows you to get a healthy amount of vocal signal to your daw without need for extra EQ later on. Why not make your life easier at the offset? Secondly by recording so close, every slight bob of the singer’s head can affect the volume of the track greatly. The vocal volume goes from perfect one minute to annoyingly loud and awkward the next. Or the opposite, you’re getting a healthy signal to your DAW when all of a sudden the volume drops and you can’t make out the words. You might find yourself compensating for this by reaching for the gain knob on your preamp (which is annoying) or inserting a compressor to help out a bit, either way it’s a silly problem to deal with. But all of this can be avoided by backing up closer to a foot or more away from the mic due to another geeky term, the Inverse Square Law, which basically means the further away you are, the less drastic of a volume change you’ll get from the inch or two movement in or out by the singer. This gives you way more play as the engineer. Your vocalist can bob around all he or she wants and you’ll get a much more even and natural sounding performance. What About My Untreated Room? Going back to why many of us tend to record vocalists (and everything for that matter) as close to the mic as possible; it’s to minimize room noise. We want to do this because, well, we might not have a great sounding room. Or we might have noisy neighbors or street noise. But don’t be so afraid of your room. In solo you might hear more “room” than you’re comfortable with, but with everything else in the mix it usually isn’t nearly as bad as you think. And guess what? 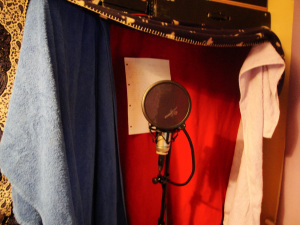 If your room sounds absolutely horrible, then don’t record vocals there! Setup shop in a closet somewhere with a bunch of clothes and pillows to tame early reflections on the wall. Then back up from the mic like I told you and you’ll get a great sound. Trust me.